My father, Jim Meiklejohn, founded the Randolph Conservation Commission and served as its chairman for nearly two decades before passing away in 2014. One of his long held goals was to see the construction of a “critter crossing” at Bowman Divide along U.S. Route 2 in Randolph, New Hampshire. 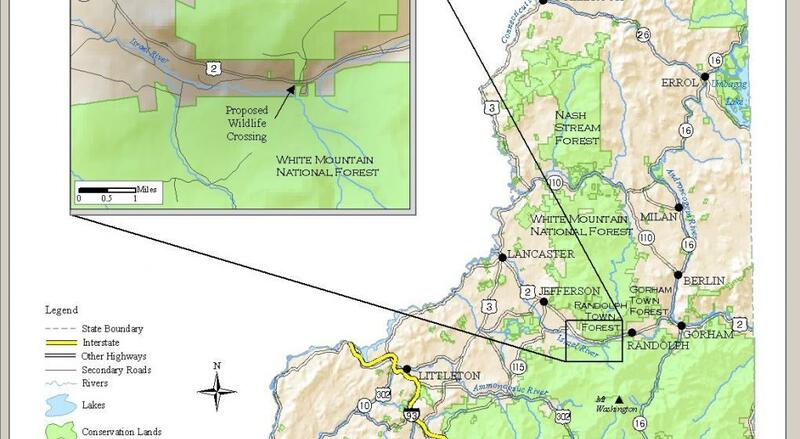 Such a wildlife corridor would logically connect the large expanses of National Forest to the south of Route 2 with the Randolph Town Forest and the Kilkenny portion of the National Forest to the north. Wildlife of all kinds cross Route 2 in the Bowman area to get to the other side. Moose, deer, black bears, coyotes, beaver and bobcats are common, and even lynx have been documented crossing the road. If we don’t see them live, we find them at the end of a trail of black skidmarks. Roads are a hazard to wildlife, and wildlife are a hazard to people on the roads. There are alternatives to good timing and bad luck. Around the world, highways have been retrofitted with bridges and tunnels that save the lives of people and animals. Wildlife crossing structures have been built in many countries and in many parts of North America to benefit species ranging from elk, bear, cougar, bison, and moose to rare mice and snakes. On a recent trip through Idaho, Nevada, Utah and Arizona, I saw thousands of these structures, mostly simple underpasses with fencing to channel wildlife to the crossing location. Wildlife overpasses and underpasses work and are effective at reducing collisions that threaten people and animals. So far, no large wildlife crossing structures have been built in the northeastern U.S., but the benefits to motorists and wildlife would be the same here as elsewhere in the world. 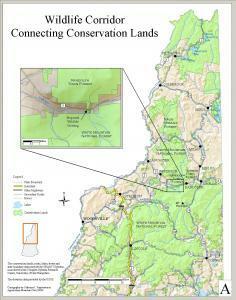 Conserved lands abut U.S. Route 2 immediately to the north and south. Wildlife use and crossings of Route 2 have been well-documented. Vehicle/wildlife collisions are common in this area and are a serious threat to travelers and interstate commerce. A critter crossing at Bowman Divide or a similar location would be a North Country attraction and would set a new standard for road design/construction in the Northeast. The idea of a critter crossing at Bowman Divide has been studied extensively over the years by the New Hampshire Department of Transportation (NHDOT), New Hampshire Fish and Game, and New Hampshire Audubon; and specific sites have been identified along this section of U.S. Route 2 where wildlife road crossings are particularly concentrated. NHDOT considered the construction of a critter crossing at the Bowman Divide location during its planning efforts when the highway was realigned in 2007. The Environmental Impact Study for that project noted that at Bowman Divide “the natural terrain on the north side of the roadway funnels wildlife to this area, making it an ideal location for a crossing, enabling access to protected natural lands to the north and south.” While NHDOT found the idea had merit based on wildlife activity and likely would reduce vehicle collisions, they ultimately did not include a critter crossing in their designs when the highway was realigned in 2007. At that time, NHDOT estimated the costs for an underpass crossing at the Bowman Divide location to be in the range of $250,000 to $350,000. In addition to the Bowman location, large culverts at sites just west of the Mount Jefferson Motel in western Randolph and at Stag Hollow Brook near the junction of NH Route 115 and US 2 could easily be adapted with minimal cost to serve as effective critter crossings. In 2016 New Hampshire State Senator David Watters sponsored and passed Senate Bill 376, An Act Relative to Wildlife Corridors, in the New Hampshire State Legislature. This legislation was initially focused specifically on encouraging state agencies to advance critter crossings on U.S. Route 2 but was ultimately broadened to facilitate the construction of wildlife crossings throughout New Hampshire. Before my father died, he asked that we “do something green” for him. The idea of a critter crossing at Bowman Divide is an idea whose time has come. Randolph has been a trailblazer in land conservation through an innovative and extensive town forest. A critter crossing at Bowman would allow wildlife to move between the Town Forest and national forest more easily and more safely for them and us. Let’s break this trail to save the lives of people and wildlife.